I read in total, 9 volumes of Fables comics and re-read Fables: 1001 Nights of Snowfall. This series is a lot of fun, especially if you're interested in fairy tales. It's dark, political, intelligent, witty, engrossing, but above all (since it is a comic), the illustrations are gorgeous. Bill Willingham and Steve Leialoha make one fantastic comic book! I think these are worth reading even if you don't like fairy tales, although you might be slightly less invested in the storylines and characters. 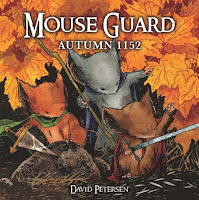 David Petersen, like Katie Cook, has become one of my favorite illustrators/artists. A co-worker first convinced me (it didn't take much) to read this a few years ago, but to be honest, it was only available in hardcover and I couldn't afford it. I got lucky and saw a Bargain edition on Amazon for $10 and snagged it. Now I'm just waiting for the cash to pick up the next volume (Winter: 1152)! If you liked "The Secrets of N.I.M.H." or get all gooey for sentient, furry creatures with wicked sword-fighting skills this is a must read. David Petersen also recently did a Robin Hood Muppets comic book run that recently came out in TPB. Yes, I'm going to get a copy and I'm going to love it. To be honest, the only reason I picked this up was because I met Frank Beddor at Wondercon in 2008 and he had it out on his table. He was very gracious and understanding--I'd left my Looking Glass Wars books at home--and proceeded to sign everything he could grab (freebies like postcards, bookmarks, etc...). He then handed me his card and said I could mail the books in so he could personalize them for me. I was so glad, I purchased this in hardcover right there and watched him sign it for me. While it's not as fun as his Looking Glass Wars books (I have yet to read ArchEnemy) and the illustrations aren't my favorite, it was still a good read. The illustrations are dark, with that rough sketchy quality and luscious colors. It's perfect for the storyline and the character of Hatter Madigan. There is a second volume out, but I don't think I'll be picking it up. I won this from a Suvudu's Holiday Extravaganza Sweepstakes after diligently entering every single day (because the prizes were so good). While I didn't get the Star Wars Essential Guides I had my eye on, I'm really glad I won this instead. Bat-Manga! is a collection of rare, never-before-seen-or-hardly-seen-in-the-US comics of Japanese origin from the 1960s. 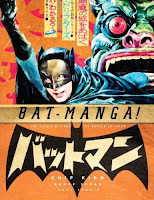 Boosted by the kooky television show with our favorite Adam West, Japan wanted more Batman. Most of the comics collected (over many, many years) are unfinished with dangling plotlines that left me in suspense (how does Batman catch Clay Face?! Does he turn into a pterodactyl again?!). Two collections have a full run, which is nice, but doesn't detract from the ones that remain unfinished. Although the introduction does say the missing pieces have been found. I'm hoping they'll release a Bat-Manga! 2 so I can finally find out what happens. If you like Japanese comic books (manga), like Batman, or appreciate how nutty and strange the dialogue can be in Japanese comics and other storylines, then you will be delighted with this. It was a lot of fun and I look forward to the next volume! This was also in my Suvudu Prize Pack (along with a SF book that I will be reviewing). I don't really know what to say about this comic (I think it's called comic journalism), but it was very sobering. The illustrations are hard to look at, only because they're so bold, punctuated with bright colors. Juxtaposed against the emotions in the characters faces, their movements, and the setting, it was very jarring. I'd recommend this to anyone, not just comic book fans. I read no Star Wars comics this year. I know, it's terrible. But I do have a lot that I've bought in the last two years that I will get to (because I must if I'm going to fill up on even more scratch & dent 50% off sales at WonderCon in April). Let me name the pile awaiting me for the coming months: the prequel trilogy TPB volumes, Star Wars: Visionaries, Star Wars: Tales vol. 1, and Star Wars: Clone Wars TPB vols. 3-6. Not to mention the TPB volumes I have yet to buy like the new Thrawn Trilogy set, Droids Omnibus, Boba Fett Omnibus, Shadows of the Empire Omnibus, Emissaries and Assassins Omnibus, Menace Revealed Omnibus, Rise of the Sith Omnibus, Early Victories Omnibus, Tales of the Jedi Omnibus vols. 1 & 2... There are plenty more. Although I don't think I'll be picking up any of the Legacy series. Those grate against my sense of continuity. Even though I didn't read many comics, I had a lot of fun with the ones I did get to. I'm also looking forward to picking up more in the next year and am always up for recommendations. Although I'm considerably more picky with my comics than I am with my books. Has anyone else read any good comics lately? @TJ Those are the Dark Tower ones, yes? I remember seeing those. I really adore Fables. There's another spin-off with Cinderella's character coming out next year that I want to read. The Jack spin-offs don't interest me--Jack's not a very likable character. I've always wanted to read Fables because I'm such a fairy tale nut, but now that you've mentioned "Bat-Manga! ", I HAVE to check that out. 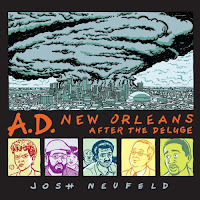 And you're right in thinking "A.D. New Orleans After the Deluge" is a journalism comic. I have yet to read it, and I'm really hesitant to (journalism comics are not really my favorite genre of comics). Thanks for making this post! @Kelci More people should read Bat-Manga! It's really fun if you can appreciate the crazy dialogue that makes it so hilarious to read. It's out in paperback, too, so it won't be as expensive to purchase. If I had heard the term by itself, I don't think I would have even tried to read any journalism comics, but this one was so touching and heart-breaking. There's aspects of what happened that I didn't know about. Seeing it in pictures piece by piece really helped me understand what happened better than the news did!